With the FME Data Inspector it’s easy to open and view any number of datasets and to query features within them. The FME Data Inspector provides two methods for viewing data: opening or adding. Opening a dataset opens a new view window for it to be displayed in. Adding a dataset displays the data in the existing view window; this way multiple datasets can be viewed simultaneously. Datasets can be opened in the FME Data Inspector in a number of ways. Select the toolbar button Open Dataset. Opening data from within FME Workbench is achieved by simply right-clicking on a canvas feature type (either source or destination) and choosing the option ‘Inspect&apos;. All of these methods cause a dialog to open in the FME Data Inspector in which to define the dataset to view. Opening a dataset causes a new View tab to be created and the data displayed. To open a dataset within an existing view tab requires use of tools to add a dataset. 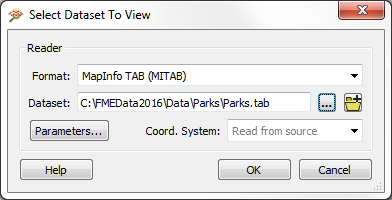 Once data has been opened in the FME Data Inspector, there are a number of tools available for altering the view. The ability to view maps (or other imagery) as a backdrop to your spatial data is activated by a tool under Tools > FME Options on the menubar. 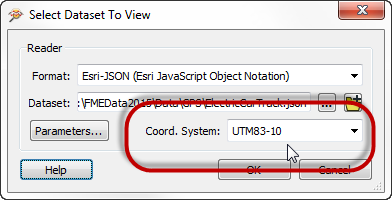 I&apos;ve also deduced that it doesn&apos;t matter what coordinate system the data is referenced against; FME will automatically convert it to whatever system is being used by the background map.